Mercury Cloud Enterprise edition, provides medium to large institutions with a low maintenance and completely customizable housing and residence life solution to manage their diverse student populations. Mercury Enterprise delivers all of the functionality of our Mercury Core product but with a completely customizable and branded experience for both students and staff. Imagine unlimited, site-defined user roles with custom menus, screens and endless online student facing processes! "Campus CIOs are taking note of the benefits of SaaS solutions, and they’re not the only ones. Gartner researchers estimate that by 2017, at least 75% of higher education institutions buying or replacing student information systems (SIS) worldwide will choose SaaS- or cloud-based solutions." 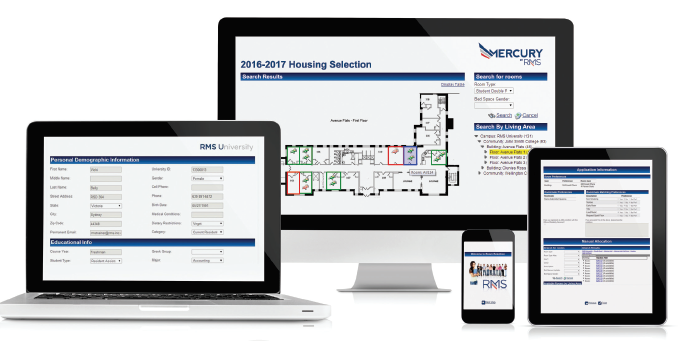 With higher education institutions moving to Software as a Service (SaaS) and cloud-based solutions for their student information systems; RMS is leading the way for Housing and Accommodation Management solutions with Mercury Cloud. So why should you move to Mercury Cloud? Far-reaching system availability for your staff and students: Mercury Cloud software is available anywhere in the world your staff and students are connected, and on the mobile devices they use most. ​It is fully web-based for both students and staff, and works with Safari on Apple devices, Google Chrome, Firefox, Internet Explorer, Microsoft Edge, and in mobile browsers. A system that scales to fit your needs: As your organization grows and changes, the features and power of the software can grow with you. Reliability: Mercury Cloud is delivered from a facility with both a 100% Network Uptime and 100% HVAC/Power Uptime Guarantees (excluding scheduled maintenance). Antivirus protection: Mercury Cloud employs enterprise level antivirus protection for virus, spam and spyware. ​Resources: No Database Administrator or Architectural System Admin staff needed. RMS manages all of the infrastructure and data backups, ensuring dependable and consistent availability of your Mercury system. Industry leading support: Our in-house Support staff have direct and secure access to your system, to provide assistance quickly and efficiently. Software updates without disruption: RMS staff manage the server , operating system and database updates as well as Mercury upgrades to ensure the software is functioning at peak performance at all times. Please contact us today to request a product demonstration!